A hot topic in the field of cancer immunotherapy is: How do some cancers that initially respond to immune checkpoint inhibitors develop resistance later? Immune checkpoint inhibitors, a class of immunotherapeutics that release the brakes on immune cells so they can attack cancer cells, are being talked about widely because they have been yielding durable responses in patients with different cancer types and in those whose cancers are at an advanced stage. As discussed recently, the U.S. Food and Drug Administration has approved the use of immune checkpoint inhibitors to treat six different types of cancers so far. Examples of approved drugs include ipilimumab (Yervoy), which targets the immune checkpoint CTLA-4, and nivolumab (Opdivo), which targets the immune checkpoint PD-1. About a third of patients receiving these therapies respond. 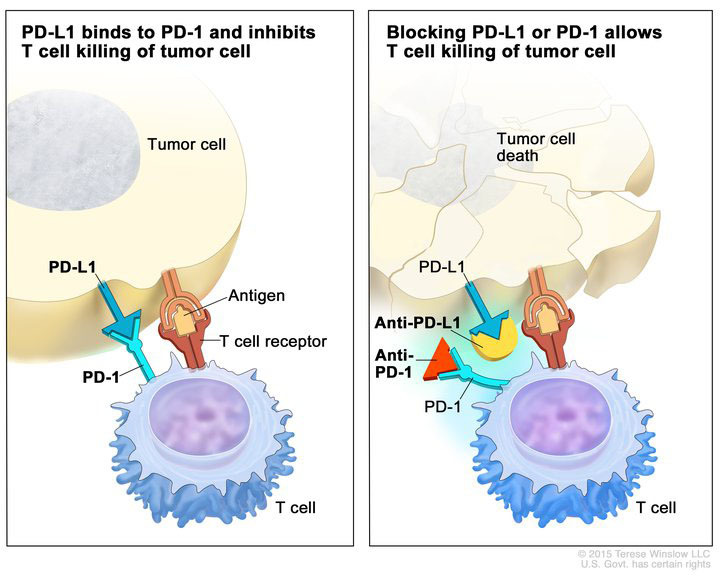 Immune checkpoint inhibitors (anti-PD-L1 and anti-PD-1) blocking the binding of PD-L1 to PD-1, which allows the T cells to kill tumor cells. Image provided by the National Cancer Institute. The challenge, however, is that a significant proportion of these patients eventually develop resistance to these therapeutics. Several research teams have buckled down to address this by analyzing tumor samples collected before the start of the therapy and after resistance develops. For example, studies published last year in Nature Communications and The New England Journal of Medicine reported that some cancers develop resistance to anti-PD-1 drugs by upregulating checkpoints other than PD-1, such as TIM 3, or by acquiring genetic alterations that make the tumors less sensitive to the drugs. 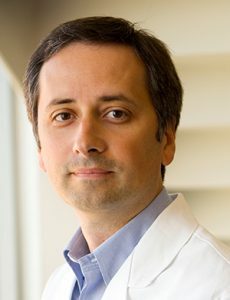 A research team, led by Victor Velculescu, MD, PhD, program leader in the Bloomberg~Kimmel Institute for Cancer Immunotherapy at Johns Hopkins, found something different: In their study, the researchers found that tumors that initially responded to anti-PD-1 drugs discarded some of the mutations present in the tumor cells, making them resistant to these drugs. “One of the main reasons immune checkpoint blockade works is because the immune cells of the patients recognize neoantigens,” says Velculescu, who along with his team, published their seminal findings in the AACR’s journal Cancer Discovery. Neoantigens are proteins produced as a result of tumor-specific mutations present in cancer cells, explains Velculescu, a past member of the AACR board of directors. Immune cells recognize such mutation-associated neoantigens, or MANAs, and eliminate the tumor cells. The team found that by losing some of these MANAs, the cancers manage to evade the immune system, thus making them resistant to immune checkpoint inhibitors that boost these immune cells. Velculescu; Valsamo Anagnostou, MD, PhD, instructor of oncology at the Johns Hopkins University School of Medicine; Kellie N. Smith, PhD, a cancer immunology research associate at the Johns Hopkins University School of Medicine; and colleagues used tumor samples from four patients with non-small cell lung cancer and a patient with head and neck cancer, collected before they were treated with nivolumab or nivolumab plus ipilimumab and after they developed resistance. Genome-wide sequencing analyses revealed that the treatment-resistant tumor samples had lost about seven to 18 of the MANAs that were present in the tumors before therapy initiation. Through laboratory experiments, the researchers also demonstrated that the eliminated MANAs played a role in the expansion of the T cells that go after these cancer cells, which meant that the tumors developed resistance by essentially eliminating antigens that are required for a functional immune response against them. “We found that there are two ways in which the cancers discard these mutations in the process of becoming resistant,” explains Anagnostou. One is by elimination of subclonal mutations, in which the tumor cells that have the mutation are destroyed but other tumor cells that don’t have these mutations grow back. The other scenario is where the tumors lose the clonal (or truncal) mutations, which are mutations present in every cancer cell. The tumors lose the truncal mutations through a genetic event, such as by losing pieces of chromosomes that contain the neoantigens. Tumor cells that no longer contain these chromosomal regions grow out and take over the cancer. “Discarding mutations is a new mechanism, as far as we understand, in the world of resistance to cancer therapy. It came as a surprise,” Anagnostou notes. Tumors are known to develop resistance to therapies, particularly targeted therapies, almost always by the acquisition of secondary mutations at the site of binding of the targeted therapy. “One might think that’s how tumors would acquire resistance to immune checkpoint or other immune-mediated therapies as well, but what we saw in our study was the opposite – we saw loss of mutations instead of acquisition of mutations,” Velculescu notes. “This just goes to show how creative cancers are in avoiding therapies,” he quips. There are a couple of ways we could move forward with treating patients who stop responding to immune checkpoint inhibitors, Velculescu says. One approach is to develop personalized immunotherapies for such individuals against the remaining antigens in their tumors. The other approach is to increase the number of initial antigens that the checkpoint blockade can work against. “We don’t know the exact number of neoantigens that the immune system recognizes, but from our study, it appears that it is a relatively small number because that’s the number of neoantigens that were being lost,” Velculescu notes. Increasing the number of neoantigens that are being recognized by the immune system might make it harder for the tumors to lose many such mutations, he explains. Velculescu, Anagnostou, Smith, and colleagues are working with multiple institutions to study acquired resistance to immune checkpoint inhibitors in more samples and in other tumor types. This study was in part funded by the Stand Up To Cancer-American Cancer Society Lung Cancer Dream Team Translational Research grant and the Stand Up To Cancer-Dutch Cancer Society International Translational Cancer Research Dream Team grant. The AACR is the Scientific Partner of Stand Up To Cancer. ← Can a Serum Biomarker Predict Response to Immunotherapy? 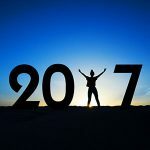 Get the latest blog posts delivered to your inbox.